It’s been a while since the last part of this very occasional series (! ), so we thought it was about time to shatter a few more myths about something many people don’t give a second thought to. Like all the things we’ve covered so far it sounds like such a good idea. Something to make life easier. In this case as part of any weight loss – or management – programme. So what are we talking about? Aspartame, the grandfather of artificial sweeteners. Or, if you prefer to use one of its many brand names: NutraSweet, Spoonful, Equal Measure. The tale of aspartame is a fascinating one, with many unexpected twists and turns along the way. So here we go. Aspartame dates back to 1965 when it was discovered by James M Schlatter, a chemist working for G D Searle and Company. As so often is the case, he stumbled on it by accident while working on another drug, in this case one to treat ulcers. The story goes that while he was working on an ethanol mixture in a flask, he accidentally spilled some on his fingers. When he later absent mindedly licked them, he found that this mixture tasted sweet and aspartame was born. Aspartame was FIRST approved by the FDA – America’s Food and Drug Administration – in July 1974. However, objections filed by Neuroscience Researcher Dr John W Olney and Consumer Attorney James Turner, led to this approval being put on hold in December of that year. These objections focussed on aspartame’s neurotoxicity and concern that it could cause brain damage, particularly in children. At the same time an investigation into G D Searle’s research practices highlighted a number of failings in the way aspartame was tested. In addition, and more worryingly, it was found that research by a company employee in 1971 showing its neurotoxicity was ignored. Keep these early warning bells in mind as you read on. It wasn’t until 1981 – immediately after Ronald Reagan’s inauguration – that aspartame was finally approved for dry goods and then in 1983 for carbonated drinks. In Europe, it was first approved by several European countries in the 1980’s; while EU wide approval didn’t occur until 1994. It’s was given the number E-951. As a quick aside, G D Searle was bought by Monsanto in 1985, with The NutraSweet Company becoming a separate subsidiary. And, finally, the patent for aspartame expired in America in 1992, which opened the floodgates to many of the artificial sweeteners we see today. Aspartame is marketed as a low calorie sweetener, 200 times sweeter than sugar. It’s used to sweeten many processed foods and drinks, as well as being used as sweetener at home. With it not only saving calories, but preventing tooth decay too, it’s easy to see why it’s become so popular. What happens when we consume aspartame? Aspartic Acid (40%), an amino acid and neurotransmitter found in the brain. Phenylalanine (50%), another amino acid found in the brain. Methanol (10%), also known as wood alcohol / poison. At the same time Phenylalanine levels increase, leading to dangerously high levels in the Brain. Among other things, high phenylalanine levels trigger a reduction in serotonin levels, which have been linked to a number of emotional disorders. For those consuming aspartame on a regular basis, this leads to a permanent increase in phenylalanine levels and not just when aspartame is consumed. Finally aspartate levels also increase, leading to high levels in the Brain. This in turn stimulates the release of calcium within neurons and the production of excessive amounts of free radicals, which kill neurons found within the Brain and Nervous System. Given all of this, it’s no surprise that the balance of the digestive system overall is also altered during this process. Levels of so called “good bacteria” needed for the digestion of food – among many other things – fall and the Immune System is stimulated by this toxic attack. To date over 90 side effects have been associated with aspartame and it accounts for over 75% of adverse food reactions reported to the FDA in America. These include headaches, dizziness, vertigo, seizures and other epileptic type symptoms, memory lapses, nausea, gastrointestinal disturbances, palpitations, anxiety attacks, insomnia and,ironically, weight gain and obesity. So what does this mean healthwise? As you can see from what has already been said, the chemicals making up aspartame all target the Brain and Nervous System, albeit in slightly different ways. 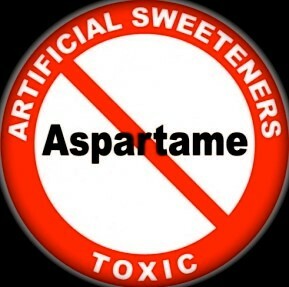 Research – in the 1970’s before aspartame was finally approved and since then – has repeatedly linked aspartame with toxicity, brain tumours, lesions and changes in brain chemistry. Of particular concern is the effect it has on children’s brains. If this wasn’t enough, research in 2014 found that rather than preventing the problems associated with sugar laden drinks, those with aspartame caused the same problems. In a strange twist of fate, instead of helping in weight management / loss it’s been found to have the opposite effect. This is because it doesn’t trick the body into thinking it’s had a “sugar fix” and so turn off hunger signals. Instead it stimulates the appetite for sugar. When it doesn’t arrive, these hunger signals are replaced by cravings for sugars and carbs, with predictable consequences. If you’re in any doubt about this just talk to someone who uses low calorie foods and drinks and they’ll say that they just don’t fill them up. And so they end up eating something “naughty” to satisfy their hunger pangs. You won’t hear much about this in the mainstream press, but this connection has been recognised in medical literature for at least the last two decades. Over and over again, research has shown that aspartame doesn’t live up to the hype. In light of all of this it’s not surprising that avoiding aspartame is seen as a sensible precaution by many. What is most sad is that, despite all the damming evidence, the scientific consensus still doesn’t consider it a risk. By the time they do it will be too late for many people. And if you need another reason to avoid it, do you know how aspartame is made? And if you’re squeamish we’d suggest you miss out this section (!). According to the patent, genetically modified e coli bacteria are cultivated in tanks; which then defecate proteins containing the aspartic acid-phenylalanine amino acid segment used to make aspartame. As always the question is quite simple. Are the risks associated with aspartame worth the false sense to security they give? To us the answer is obvious. The focus on this blog is ALWAYS on helping you make small changes every day to improve your health and wellbeing. Not only is this an easy change to make, but one with long term benefits for you.